I’ve been trading emails and phone calls with the good folks at Open Source Radio today — I mean, they’re probably all good, but I’ve been in touch with Chris Lydon and David Miller — about me appearing on a follow-up segment to their show last night with Christopher Hitchens. I’ve said “yes,” foolishly no doubt. I’ll sit down with Margaret to figure out what I really want to say about what’s so wrong with Hitchens’ representation of faith, to figure out what that’s worth saying I can squeeze into intelligible one- or two-sentence sallies. In the meantime, I have a ton of tasks and errands to move around my desk while I muse about what to say on the radio. I gather that Adobe has consigned Freehand, the drawing program that they acquired when they absorbed Macromedia into their graphics empire, in favor of Adobe-originated Illustrator. I preferred Freehand to Illustrator, so this comes as a disappointment to me (and a constituency of other Freehand users, to judge from the response on the Net. The quick-witted entrepreneurs at Freeverse Software (motto: “We’re not just Burning Monkeys any more”) have jumped at the opportunity. Reasoning that Freehand appealed to non-Illustrator users because of its more intuitively-useable interface, Freeverse has announced that for the next week or so, anyone who buys their drawing application Lineform from Freeverse can enter the word “Freehand” in the promotional/coupon code box on the order form, for a $30 discount. I haven’t pushed hard on Lineform, but my initial impressions are positive; it’s not an all-purpose vector graphics Swiss Army knife that also microwaves your ramen noodles, but it looks like a highly-founctional vector drawing program at an optimal level of complexity for casual users. Among the things I’d call to my colleagues’ attention (if I were ever accorded the prerogative of programming a faculty event), I’d surely want to include Sir Ken Robinson’s talk at TED (link by way of Jeremy and, earlier, Jordon). Earlier Jordon had pointed to Richard Baraniuk’s talk about online education (thought I had linked to it, but I can’t find such a reference) — that’s another I’d show. But then, no one’s asking. 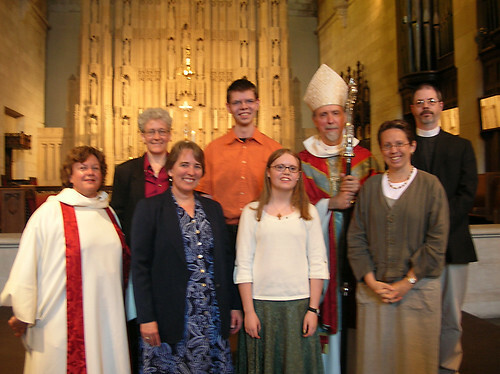 Philippa Grace was confirmed yesterday, by the Bishop of Chicago (“the XI Bishop of Chicago,” as they say). She’s been studying up — taking this as seriously as she takes everything — and preparing, shoe-shopping and meeting with her sponsor. It was a big, impressive service, and (I think) the confirmations of Pippa and our friend Käthe were the highlights of the morning. The sermon — well, better to say nothing at all. The music was lovely, the Lord was praised, and I had a chance to catch up with Jim McGee, whose son Derek was also being confirmed. OK, add “Derek” to the highlights above, though I don’t know him; Jim’s word is good by me. Anyway, chalk up another sacrament for the family, and a lovely day all around. The family has been watching Emily’s YouTube videos “Code Monkey” and “Don’t Make Me Dance” over and over; she’s terrific, and we’re rooting for her to land a professional gig. We want to see more. For all the reasonable arguments against The Long Tail and other internet “boosterism,” the fact remains that it would have been exceptionally difficult, if possible, for Emily to have produced those videos, for her to have distributed them widely if she had made them, and for people like an academic theologian in Evanston to have encountered them — apart from technologies that depend on or have been catalyzed by the Internet. And — and this drives me batty with impatience, makes me want to grab people by the lapels and shake them — this constitutes evidence of something pertinent to the future of church and theological academy. Somebody, listen! Margaret’s plane lands in an hour or so. Have I said that I’m proud of her and I’m intensely eagerly awaiting her return? This afternoon, Pippa and I will roll down to Midway Airport to pick up Josiah and Margaret. Si will be home for the summer; Margaret is coming home for good, after having been based in Durham for three years. That’s a pretty weird experience for a married person. Most of the time, once people marry, they live together pretty regularly. Margaret and I set up separate homes almost three years ago so she could study for her theology doctorate at Duke; at this point she’s got her dissertation proposal mostly hammered out, she’s through with her course work. She’s going from strength to strength, and I couldn’t be prouder of her. Now she’s saying goodbye to friends who have loved and supported her through three complicated years — people who are her friends, who know her for herself. That has been wonderful for her, and it’s very hard to tear up those roots and move back to Evanston (in this way, it’ll be especially good that we’re spending next year in Princeton). Meanwhile, Pippa and I have learned to manage all right as a two-person family. We have ups and downs — I’m more comfortable with freezer food, Pippa vigorously insists that we cook real entrees, for just one example — but the rhythm has worked out okay. In moments of triumph, I exult that in three years of transition in a young girl’s life, I did not totally mess up as a single parent! Woohoo! So much great stuff has happened that we’ve managed to keep the edge off the loneliness and frustration of living in different time zones. Now we won’t have that to keep at bay; we can hug, Margaret can rest her head on my shoulder, we can actually help one another with daily life. And we can get back to the marvelous gift of being married, together, finally! Thinking in the shower this morning — really, why don’t I just spend the whole day there? it’s when I arrive at most of my best ideas — it occurred to me to summarize my area of scholarly interest as “systems of expression and inference.” That touches on the way that articulating and uptake constitute complementary aspects of the same process: we speak/write as “I want David to understand this when I address him, so I’ll say that, which seems most likely to evoke the reaction I want,” and we hear/read as “I’d most likely have chosen those words to evoke that reaction.” The expression and inference are systemically related, and no single “law of meaning” governs all such systems. They interact and deflect one another such that one can never fully isolate a natural sign or a conventional signifier and assert a single determinate meaning for it. Thus assertions about reading “literally,” whether in favor or against, always operate by excluding pertinent contextual data; there’s no “literally” there. (Fred Clark has been pursuing this topic with his characteristic exquisite patience here and here.) Words never arrive at our attention without some accent or inflection, and if we devised a way to transmit them “neutrally,” that very “neutrality” would communicate some metatextual data, in the way that people frequently infer a great deal from a “robotic” voice. Words in a book signify differently from words spray-painted on a wall; words spoken in a flat, unmodulated tone signify differently from words whispered into one’s ear or shouted enthusiastically. But there’s no acontextual venue for words, so even the OED constitutes a context for meaning that affects interpretation (start, for instance, from its Englishness). Anyway, the shower ended, so I have to go get grubby and shower again to figure out what comes next. But that phrase, “systems of expression and inference,” I want to save and return to. Very true, but (a) procrastination often finds its most helpful allies in obligations from the more distant future, and (b) I’m just mulling it over, not writing it. And those other essays are mostly short. And. . . well, I cannot tell a lie and say that three are mostly done. I’m working on them. Margaret comes home day after tomorrow; last day of classes in two weeks. I beg faithful readers’ patience as I marshal my attention and energies toward matters pertaining to work life here at Seabury. On the positive side, Margaret will be home on Friday (!) and graduation comes in two and a half weeks. Doc points us to various links relative to the “Countries, Cultures, Communication: Digital Innovation at UCLA” colloqium. It sounds like a brain-jolting treat, especially the keynote by Willard McCarty that Doc cites (PDF, and accompanying PowerPoint slides; I sure wish they made it available as web-native media). Granted that PDF makes Dorothea’s hackles hack, note how much better use McCarty makes of that format than does the U.K. College of Preachers’ “What Did You Make Of Your Sermon?”. My eyes still hurt from looking at that.